Serves: This is a double recipe and makes 75-100 fairly large cookies. 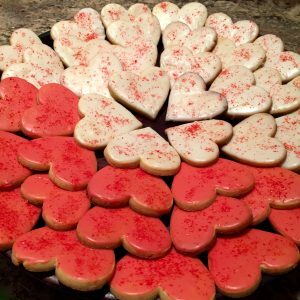 When I did a half-batch and made smaller 2″ and 3″ hearts, it still yielded about 50 cookies. 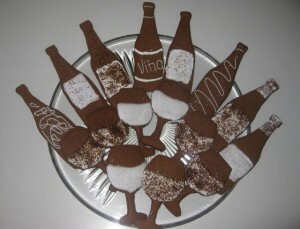 Time: This can be a 6-8 hour project if you use all of the dough, take your time cutting the cookies by hand (using a knife to cut around cardboard cut outs, like these wine bottles and glasses), and then taking your time to decorate. But if you are doing a half-batch of the ingredients below, plan about 30-45 minutes to make the dough, then it should be refrigerated for at least an hour, and plan for about 2 hours to make and decorate the cookies if you use standard cookie cutters, use both racks in your oven, and decorate very simply. Inspired by: I’ve always thought gingerbread cookies at the holidays are fun. This time I wanted to try something that I haven’t seen before. I used a Martha Stewart recipe for the cookies and the icing and doubled it. However, I’m not a fan of being overpowered by molasses and all of the recipes I saw used quite a lot of it. I substituted one more egg and 3/4 cup of brown sugar for the second cup of molasses and was happy with the outcome. Cookie cutters or cardboard cut outs of the shapes you want and a small sharp knife. Sift or whisk together flour, baking soda, and baking powder into a large bowl. Set aside. Whisk together salt and spices in a small bowl. Set aside. In a large bowl, use an electric mixer to blend brown sugar and butter together until fluffy. Add the spice blend, then eggs and molasses. Reduce speed to low. Add flour mixture; mix until just combined. You may need to finish mixing the dough by hand. Divide dough into six round balls, flatten to discs, and wrap each in plastic. Refrigerate until cold – about 1 hour. Preheat oven to 350 degrees. Roll out dough on a lightly floured work surface to 1/4-inch thick. Use cookie cutters or trace around cardboard cut outs with a knife to create shapes. Space 2 inches apart on baking sheets and refrigerate until firm (about 15 minutes). Bake cookies until crisp, but not dark, 12-14 minutes. Immediately remove from cookie sheets and cool on wire racks. To make icing – beat egg whites until stiff but not dry. (Then reserve about 1/2 -1 cup of these stiff whites in a separate bowl). Add sugar (but reserve about 1/2 cup) and lemon juice; beat for 1 minute more. If icing is too thick, add more of the egg whites from the reserve. If it is too thin, add more of the sugar from the reserve. The icing may be stored in an airtight container in the refrigerator for up to 3 days. Ice the cookies after they are cooled. Put icing in a pastry bag fitted with a small plain round tip (such as a #2 or #4). Pipe designs and immediately sprinkle with sanding sugar before the icing dries. You can also take some of the icing and put it in a small bowl, add a bit of the reserved egg whites to thin it if needed, and paint it on with a small art brush. Let icing set at room temperature for about 1 hour. Store cookies between layers of parchment paper in an airtight container at room temperature for up to 5 days. 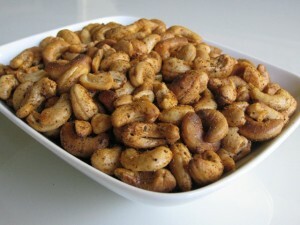 Inspired by: I’ve always loved cashews and almonds, but my favorite is when they are salty and spicy. I was headed out to a party a few nights ago and thought it would be fun to try my spice blend on some cashews. We loved them. Preparation: Set the oven to about 200 degrees. Toss the cashews in the melted butter – just barely coat them. Then toss with the spice blend until they are covered well. Spread on a cookie sheet and put in the oven for about 5 minutes. Watch them carefully – they will brown very quickly with the butter. This gives them a slightly toaster look and taste and dries the butter out a bit. 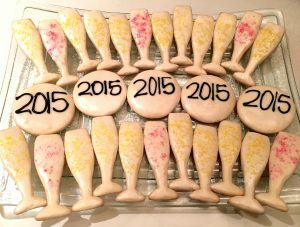 Notes: I think anything salty and fatty is fabulous with wine – so these are perfect to nibble on while sipping wine! Inspired by: Minimal ingredients in the kitchen and being so hungry that I want to make something yummy in minutes! These are great on salad, pasta and quinoa or just to nibble on their own. Normally I prefer not to cook during a party, but I hosted a party last night and it was so easy to make these while everyone was hanging around the kitchen because it just took minutes. Preparation: Heat 1 tablespoon of olive oil in a cast iron skillet or saute pan. Once it is hot, add the shrimp. Sprinkle with the spice (any amount to your liking – a small amount goes a pretty long way) and cook for about 2 minutes on each side and serve. Wine Suggestions: These are yummy with any off-dry white such as a Riesling or possibly a Viongier or Condrieu. They are also nice with a medium-bodied red with some nice fruitiness or spice such as a fairly ripe Spanish Rioja, Southern Rhone or Merlot. 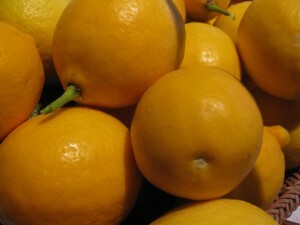 Inspired by: Arnie and Alice gave us a whole basket of beautiful Meyer lemons last night. Thank you Arnie and Alice! It’s Shannon’s birthday gathering tonight in a couple of different places so I decided to get started using a few of the lemons for cupcakes. I’ve always loved anything super lemony and the icing on these accomplishes that. This is a mishmash of a lot of different recipes I’ve noted over the years for lemon cake and icing with my various tweaks. This recipe will use 2-5 Meyer lemons depending on the size and amount of juice. I used three small lemons that were pretty juicy when I made this today. There are of course many things you can do to make these look very pretty, but I prefer to keep them very imperfect and very “homemade” in appearance. Start by grating the outside of the skins of the Meyer lemons until you have enough zest (approximately 6 teaspoons – only grate the yellow skin, not the white part under that as it can be bitter). Then juice the lemons in a small bowl until you have enough juice (approximately 5 tablespoons). In a large mixing bowl; mix the butter and sugar until creamy. Add the lemon peel and vanilla extract. (When the lemons peel has a nice flavor use more, if it’s too bitter use less). In a separate bowl – combine the dry ingredients: flour, baking soda, baking powder and salt. Mix well. Add the dry ingredients to the butter/sugar/egg mixture and mix well. Batter will be thick. Add the sour cream and yogurt and mix well. 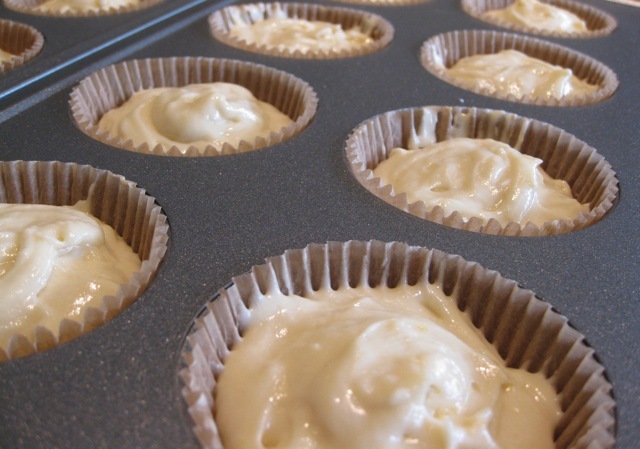 Fill paper-lined muffin cups with 1/3 – 1/4 cup of batter (depending on whether you want 24 or 30). Bake at 350 degrees for 20 – 30 minutes – until they are barely browned and a toothpick inserted in the center comes out clean. Cool for 20 minutes. Combine the butter and confectioners sugar in a medium sized mixing bowl. 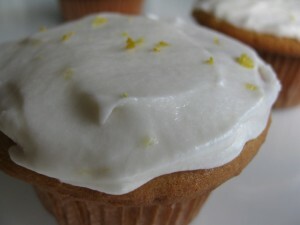 Once they are cool, frost the cupcakes and sprinkle each one with just a few tiny pieces of grated lemon peel. 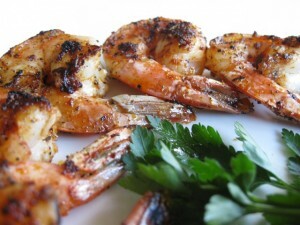 Inspired by: This recipe is from Hugh Carpenter’s “Fast Appetizers” cookbook. I was looking for a fun finger food with caviar for New Years Eve. I added a tiny bit of sour cream to these, but I think they’d be great either way. Roast until they feel tender when prodded with a fork – about 30 minutes. Cut a small scoop/hole in the top of each potato. Fill with caviar and sprinkle with chives. 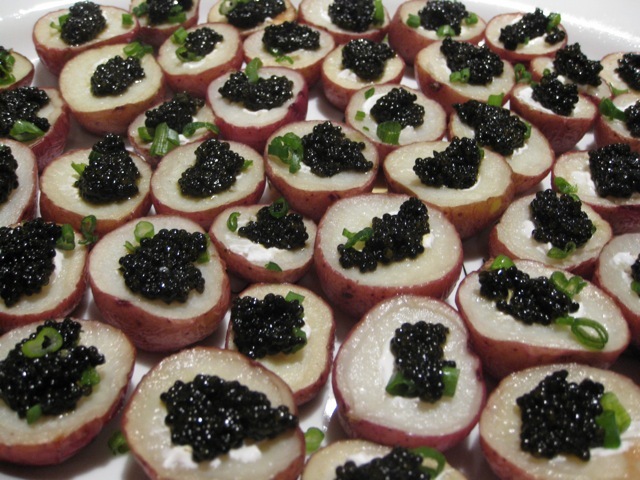 If you are using sour cream, later in just a dab of it before the caviar and chives. Notes: This can be completed up to 8 hours before serving if you are not using the sour cream. If you are, it can get a little watery so wait and assemble close to serving. Serve chilled. Wine Suggestions: Caviar and Champagne are always a fun pairing – their complimentary textures are perfect and the high acidity of the champagne is perfect with the brininess of the caviar. Of course any other dry, crisp high-acid white wine would be excellent as well such as a Chablis or other unoaked White Burgundy.